The Senate Finance Committee has just cast its first vote of the day, and the claws are already out. Senator Jim Bunning had an amendment requiring the bill to be translated into legislative language and for the CBO to post a cost estimate based on the new version 72 hours before voting. It's a proposal that would delay the vote by at least 2 or 3 weeks, and opinions divided almost strictly along party lines. "I do believe the American people are rightfully entitled to what exactly we are doing, what we are legislating," said Olympia Snowe. Unlike other committees, the tradition of the Finance Committee is to provide the bill in plain English to its legislators so they can have a more transparent grasp of the substance of the legislation. After a vote is passed, the bill is then translated into legal language, and any discrepancies between the two are resolved in favor of the plain English interpretation. Rising to defend plain English bills was Kent Conrad. "We write our bills in plain English so the members can understand them, and so the public can understand them…To most people, legislative language is gobbledy-gook." Conrad then proceeded to give an example of exactly what such "goobledy-gook" would sound like. Speaking in a droning, robotic monotone, Conrad read off the section of the bill that discussed how a certain "section K-1" would be "determined under Paragraph Two for the area of the month, IV," with the "applicable amount as defined in the subsection K1 for the area for the year…for the area for the month in 2013 so determined by national per capita growth area." Conrad's legalese drew some giggles and guffaws from the crowd. This prompted Bunning to try and brandish his wonkish cred by trying to translate the legalese back into plain English. "You're talking about home [health care] providers in metropolitan services areas that include parts of CMS," Bunning responded. "The Senator thought the language had to do with home health--It had to do with Medicare Advantage," Conrad responded triumphantly. "Members of this own committee thought--they don't know what the legal language is about." Touche: point to Kent Conrad. 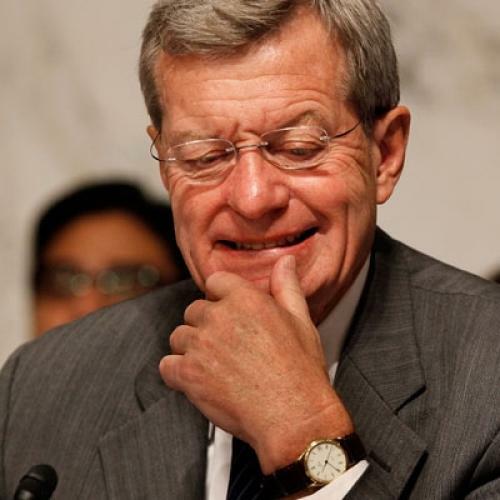 Baucus then pushed for a vote, overriding loud protestations from Bunning, who remarked sarcastically, "That‘s a way to run a ship" after the chairman tried to cut him off. The amendment was defeated, 11-12, with only Blanche Lincoln voting with the opposition. But while the Finance Committee may have been spared a two-week delay, the Republicans did manage to score something else, dragging out the deliberations over the first of some 500 amendments for the entire morning.